Crumbling ruins, iconic attractions and cobblestones for days—a walk through Rome can feel like stepping onto a movie set. The picture-perfect city almost feels like it was made for Instagram, because there is a photo-worthy thing to do (and a selfie stick seller) around practically every corner. From mornings at the market to jaw-dropping city views, charming side streets and bucket-list-ticking monuments to a photogenic dinner at one of the city’s top restaurants, bella Roma has everything you need to bring your social media A-game. To ensure that your followers are suitably jealous of your new #dolcevita lifestyle, we’ve rounded up the most Instagrammable places in Rome. Just be sure to put your phone down while Vespa-ing. Rome may have more than 900 churches, but it’s St. Peter's Basilica that reigns supreme among them. The Vatican's basilica is the largest and most opulent church in all of Italy. A list of the artists who helped create the magnificent structure reads like a who’s who of the Renaissance. Inside you will find Michelangelo's Pieta, Bernini’s lavish bronze altar piece and Bramante's distinctive window-lined dome. It’s hard to know what to post to Insta-stories first because every inch of the massive church seems to be covered in marble or gold. 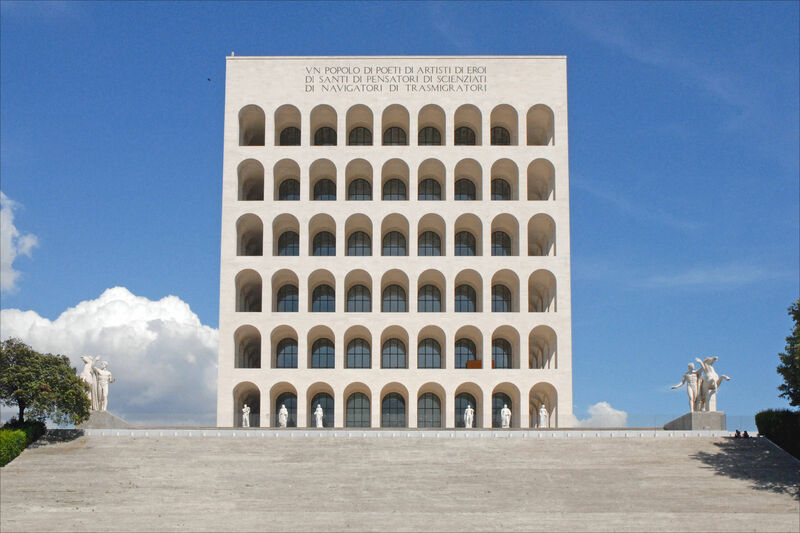 The exterior of the building is no slouch either, with the square on which its sits surrounded by an enormous colonnade topped with 140 statues. But the photo that will get the most likes is definitely the shot from the top of the dome… you just have to be willing to climb 551 steps to get it. Once considered to be the wrong side of the river, Trastevere has established itself as one of Rome’s most charming quarters. The area is filled with small ivy-draped lanes that spiral out away from a lively central square. Some of those scenic alleyways are, admittedly, packed with boisterous students seeking abundant drinks and late night crowds, but during the day Trastevere has a serious cute factor. Catch the piazza at sunset, or snap photos of the artisan workshops and tiny boutiques on Via del Moro. For the most Instagrammable corner, find the vine-covered alleyway called Vicolo delle Torre off of Via della Lungaretta. 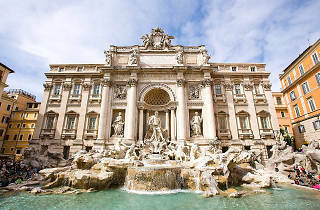 You will hear the Trevi Fountain before you see it. The thunderous Baroque masterpiece takes its name from the “tre vie” (three streets) that converge in front of it. As pretty as the cascading water sounds, the Trevi is really meant to be ogled and photographed from all angles. It is Rome’s largest fountain by far, and sits at the end of an aqueduct that has been running since 19 B.C. At 85 feet tall and 65 feet wide, Instagramming the entire fountain in one glorious shot may take a bit of practice. However, the most classic photo requires stepping through the crowd to the edge of the water to get a coin toss action shot. 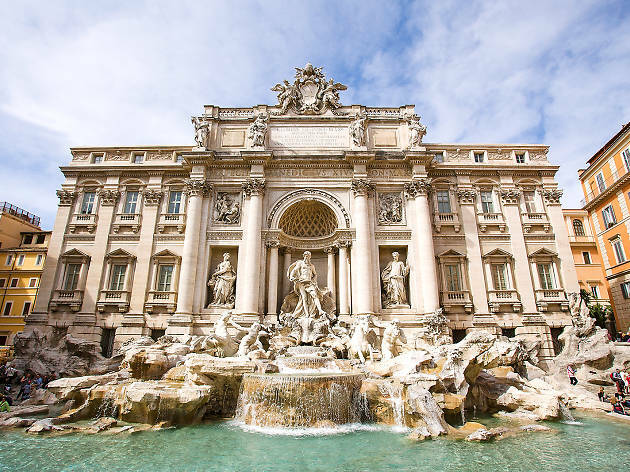 Aim over your right shoulder with your back to the stone masterpiece and a popular legend guarantees that a coin thrown into the fountain means you will return to Rome again. Coin tossed, fingers crossed! High above Piazza del Popolo, the gorgeous Pincio Terrace looks out over the historic centre and on towards the distinctive dome of St. Peter’s basilica at the Vatican. The viewpoint sits on the edge of Villa Borghese, which is essentially Rome’s version of Central Park. Even though the high point is only a few minutes’ walk from the crowds indulging in retail therapy on Via del Corso, the Pincio Terrace stays relatively quiet. Rest against the railings to find unobstructed panoramic views for your #RomeLife selfie, or keep walking into the gardens for lush backdrops and tranquil picnic spots. The Colosseum has been Rome’s most recongnisable building since it was inaugurated in 80 AD. Even at first glance, it is easy to see why the monument has endured–the smooth travertine curves are irresistibly timeless. In its heyday, the stadium would have been even more impressive because each of the now empty arched openings was once filled with marble statues. Despite its current toned-down appearance, a recent deep clean has left the stone Colosseum gleaming once more. The view from outside is iconic, but once inside it’s possible to travel into the depths of the arena to explore the ruins–which might be the most impressive photo spot of all. After all, does a trip to Rome even really count if you don’t get a snap of the monument? Rome’s Ostiense district sits a bit outside the historic centre but is worth the trip to get a more urban taste of the Eternal City. The neighbourhood is home to some of the best street art in Rome–which creates an amazing backdrop for photos. One work in particular, a mural by a street artist known as Blu, is good enough to stop traffic. The piece covers a decommissioned barrack on Via del Porto Fluviale, wrapping around the entire three-story building. Built out of bananas and with windows for eyes, Blu’s bright, monstrous heads create the attention-grabbing scenery needed for a modern Roman selfie. Currently home to a vibrant flower and vegetable market (though many other souvenir stalls are encroaching), Campo de’ Fiori offers one photo op after the next. In the morning, local vendors set up stalls for fresh produce, and prosciutto legs hang temptingly in shop windows. For quieter angles, the side streets retain much of their original charm. Most are named for the types of artisans who once had shops there, such as Via dei Chiavari (key makers) and Via dei Cappellari (hat makers). It’s not all fun and flowers, though. The square was previously used for public executions in the 1600s–hence the hooded statue of Giordano Bruno who was burned on the spot for heresy when his philosophies went against the teachings of the church. Once a Bohemian enclave on the edge of the historic centre, fashionable Monti has recently moved slightly higher end. The result is a cool mix of vintage stores and family-run restaurants set between upscale boutiques and vegan gelato shops. While the traditional neighbourhood has taken on a slight hipster tinge, it remains one of the prettiest districts in central Rome. Around each cobblestoned corner, jasmine cascades down the walls of pastel coloured apartment buildings, and ivy creates a summertime curtain across outdoor patio seating. On warm nights, the neighbourhood’s main square turns into a chic BYOB affair, so sit on the steps, pop some prosecco and start ’gramming. Bypass the crowds at the Spanish Steps and get into a real Roman Holiday mood with a stroll down picturesque Via Margutta. The street was made famous in the Audry Hepburn flick because Gregory Peck lives on the glorious Roman lane. IRL, the street was home to director Federico Fellini, as well as countless artisan shops. Today, the upscale street is filled with cafes, art galleries and seriously fashionable Romans. Though it is always ready for a social media close up, Via Margutta is best in spring when the street is draped with soft purple wisteria blooms. With its embassies and elegant homes, the refined Aventino neighbourhood can feel a bit buttoned up. But quiet and tree-lined neighbourhood has plenty of vintage Vespas posed about the streets to stage the quintessential Roman photo. The area also boasts both the Orange Garden, with its panoramic terrace, and a secret keyhole. The locked door in question leads to the private gardens of the Knights of Malta. While it’s essentially impossible to visit if you aren’t a part of the mysterious sect, you can get a glimpse of the splendor by peeking through the keyhole. Get the camera zoom ready, because the peephole has a direct line of sight to the dome of St. Peter’s perfectly framed by manicured arched hedges. 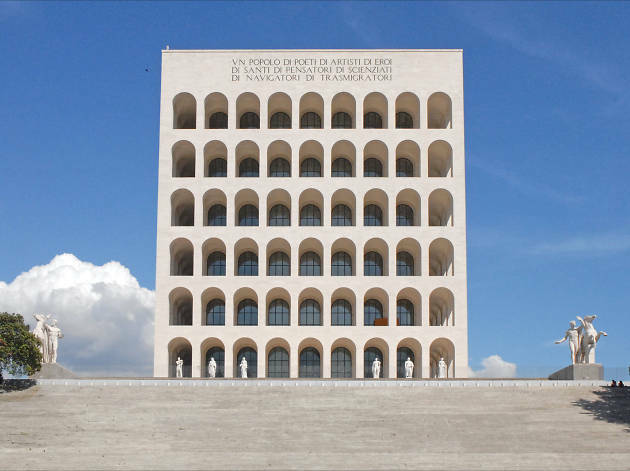 From renowned attractions and monuments to unexpectedly contemporary conceptual designs, here are the ten most beautiful buildings in Rome.